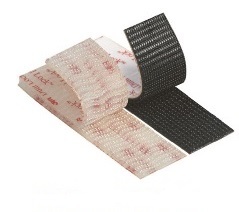 3M™ Brand Products by Industrial Webbing Corp.
Industrial Webbing Corp. is now offering 3M™ brand products online. Specifically the Dual Lock™ brand reclosable fasteners in small roll put ups and cut pieces. Dual Lock™ fastener is a reclosable fastening system where mushroom shaped stems interlock with one another when pressed together. Available in 1" black or clear, with acrylic self-adhesive backing, producing 1000+ closures. We are proud to add the line to our extensive offers of hook and loop and reclosable fasteners and please call 800-635-5252 x 1 for sales with any questions you may have about our 3M™ product offerings.